Five Horizons: What's New for November '96? Chris sets new procrastination record. :) Over eight months after aquiring the rare 12" vinyl basketball picture disc release of Ten and promising to scan it for the discography ("soon") I finally did so last night. Added setlists and brief notes for Lisbon shows to 1996 Concert Chronology. Added more notes for Augusta and Buffalo shows to 1996 Concert Chronology. Added many missing setlists and soundchecks to 1996 Concert Chronology, thanks again to Leo Cailleteau, and to Andrew for phoning it to him! Added more notes to Charleston show in 1996 Concert Chronology. New news items today: No 1996 Christmas single, the Five Horizons statement about the Rolling Stone furor, and info about the forthcoming Brad album. Added Budapest setlist and comments to 1996 Concert Chronology. 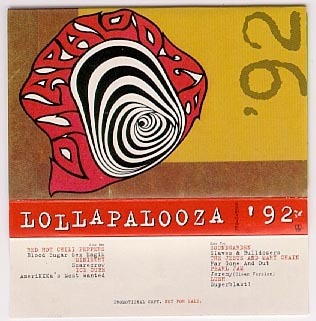 Placed Lolla '92 poster scan at top of 1992 Concert Chronology (part 2). Five Horizons just acquired a scanner for our own personal use. ;-) Look forward to tons of new scanned stuff in the coming weeks! Added Prague setlist and comments to 1996 Concert Chronology. Added Milan setlist to 1996 Concert Chronology. ID'd Beatles' song snippet at end of 'I've Got a Feeling' jam at 2/28/92 London show. Corrected setlist discrepancy and added comments to 3/12/92 Frankfurt show. Tablature: 5H has found a great resource for original, quality tablature. Check them out in our Songs section. Added a few things to the 1996 Video Guide. Added link from the Concert Chronology to Toronto listing in the 1996 section of the Video Guide. We've had to remove our "Olympic Platinum" page temporarily. We'll be receiving a stereo copy of the song soon and will put the page back up with additional details from fans in Atlanta as soon as we can. Well, the Five Horizons Live Berlin Simulcast is now over. ;-) Hope it was useful/enjoyable/amusing to you. ;-) The setlist and comments are still on the Berlin page. We'll archive this eventually and Jean'll make her additions to the Concert Chronology. The LAST installation of Berlin stations has been added. Please, no more! ;-) [ thanks to Karen Coluzzi, Kirsten and Ville Kononen) If you don't have a station in your area, bookmark our "Berlin" page tomorrow and keep hitting 'reload'! We'll post the setlist w/comments as the show is broadcast! Added soundcheck and modified notes to 11/5/93 (Indio) show (based on Matt's Hale's firsthand account).